Seen here in the summer of 1969 when almost new, NDL 769G was one of four Bristol LHS6L buses delivered to Southern Vectis with 7ft 6ins wide Marshall B35F bodies of curiously old fashioned appearance. The flat glass windscreen with angled corner glasses was reproduced at the rear. To my eye the utilitarian result had something of the air of a welfare vehicle or a mobile library. Only nineteen examples of this design were constructed. 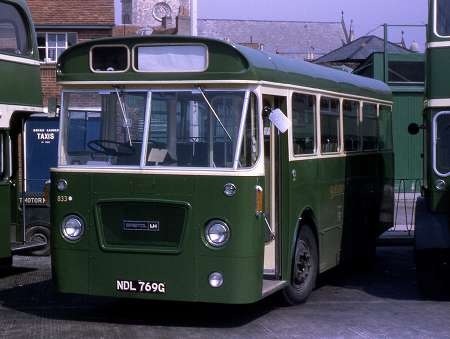 Twelve similar bodies with 33 seats on LHS6L chassis were supplied to Western National in 1972. Gash of Newark took two, one in 1973 and the other in 1975, but these were 8ft wide. Harvey of Mousehole took a single narrow example in 1977. In all cases the chassis was the LH6L with the 6.54 litre Leyland 400 engine, or, from 1971, the more powerful 401, which was coupled with a Turner five speed synchromesh gearbox. The bus shown above was bought by United in 1977 and is currently in preservation, though the livery it now wears is, in my opinion, an offence to the eye – see what you think at this link. I agree entirely, Roger. The current livery is simly awful. Yes, Pete, the location is Newport. The church in the background is Newport Minster. Please forgive the omission. This style of body has always puzzled me. Marshall constructed a large number of single deck bodies of (what one might call) basically BET appearance with curved glass windscreens, and I supposed that the reason for the flat screens lay in the narrow 7ft 6ins width of the vehicles. However, Gash took two with the same front and rear end design, and these were 8ft wide. The narrow Bristol BN and BS classes of London Country and London Transport respectively had curved front windscreens and flat glass at the rear, though these vehicles were delivered from 1973 onwards. Surely this curved screen was available in 1969. I doubt that the relative costs would have been a factor. The complicated rear screen on the Marshall would have negated any (debatable) cost saving when replacing the various flat glasses at the front. I imagine, also, that this Marshall feature was structurally weaker. Marshall also produced a "coach" version mainly for WNOC in particular that had curved glass in the windscreen. David W – I couldn’t agree more, Except that I would not use the word "livery" – rather a freelance graffiti exercise, and a bitter disappointment compared with even the NBC version of United’s livery. I have seen a Leyland National with a ‘paint job’ similar to the United one, but I’ll not send you running for a darkened room by offering it for publication. No doubt someone will come up with more information. Photo; VOD 88K Bristol LHS/Marshall of Devon General O&TC. 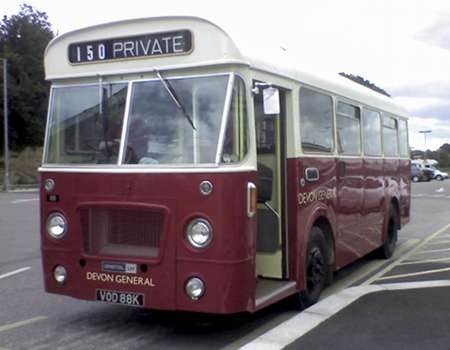 It is so good to see the oddities and rarities of vehicle styles from the past, as a contrast to the Southern Vectis LHS/Marshall, I offer this Devon General preserved in the pre-National Bus Company red version of the British Transport Commission livery. This view was taken at Yeovil Junction railway station on the border of Somerset and Dorset during July 2010. These narrow Marshall bodied vehicles were ideal for rural routes but were never taken in great numbers by the main transport groups of the time. Devon General only became a Transport Holding Company subsidiary in 1967 on the occasion of British Electric Traction selling its bus interests to the Ministry of Transport. By the time this bus was delivered the company was a subsidiary of the National Bus Company. Prior to late 1972 the NBC had operated without corporate liveries. I think we can be reasonably sure that the body order for these LHSs went to Marshall because of the narrow width requirement. ECW were building bodies for LHS around the same time (for Lincolnshire and Luton Corporation), but these were 7′ 10" wide, as were the contemporary bodies on the longer LH chassis at that time. I am not sure if the narrow version of the BET windscreen was available at that time, but I believe the principal problem was the height, rather than the width. The basic structure of the body looks to be similar to the Marshall Cambrette bodies built on Bedford VAS chassis for Coventry and East Kent a few years earlier. The radiator of the Bristol LH range was set relatively high, so that Marshall would not have had very much scope to extend the aperture for the windscreen downwards, while an enlargement upwards would have intruded into the destination display area. The only other option would have been to use the shallower rear screens of the BET curved variety, but I am reasonably sure they were even shallower, and the aesthetics of the vehicle would have suffered, not to mention the driver’s field of vision! The multi-pane version adopted was already being used for export vehicles, so I suspect the adaptation for these LHSs was a simple and effective solution. The 10 Bristol LH coaches that Marshall bodied for WN (with mixed BDV-L and NTT-M registrations) had a different body structure with a shallow roof and deeper side windows, which meant that the BET screens could be accommodated. I would hazard a guess that the structure of these was derived from those that Marshall built for the MoD, usually on Bedford SB chassis, though I believe that some later vehicles were built on underfloor-engined chassis. United acquired both 832/3 NDL768/769G from SVOC and numbered them 1451/2 for demand variable services from Ripon depot in 1977 where they were sparingly used. They were then sent to Darlington depot where they were to be used for a new service serving Newton Aycliffe. 1451 was replaced by a newer ex Trent LHS/ECW also in the distinctive Newtonian colours (as befits a new town) but 1452 survived. NDL769G eventually passed into preservation replaced by, ironically, another ex SV LHS in 838 HDL415N. The ECW LHS’s continued on the Newtonian until deregulation when Merc minis brought a larger network of services though still with Newtonian fleetnames. Three LHS’s (now joined by HDL414N) were sent to Ripon (again coming full circle) where the livery was amended to Ripon City Bus. The LHS’s were then swapped with Western National though the livery was then applied to some standard LH’s (1705/6) at Ripon depot. There was ANOTHER similar patriotic livery applied to three vehicles (one was the National) but thankfully not perpetuated!